Mother to: Raymond J, Irving W (Eleanor Brown) and William Henry Jr. (Angie Ignelzi) Bielfeldt. The home of Mr. and Mrs. Henry Thielman was the scene of a novel but enjoyable event last Sunday afternoon, the occasion being the christening of two babies, the infant sons of Mr. and Mrs. Thielman and Mr. and Mrs. William Bielfeldt. 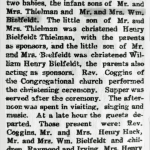 The little son of Mr. and Mrs. Thielman was christened Henry Bielfeldt Thielman, with the parents as sponsors, and the little son of Mr. and Mrs. Bielfeldt was christened William Henry Bielfeldt, the parents also acting as sponsors. Rev. Coggins of the Congregational Church performed the christening ceremony. Supper was served after the ceremony. The afternoon was spent in visiting, singing and music. At a late hour the guests departed. Those present were: Rev. Coggins, Mr. and Mrs. Henry Hack, Mr. and Mrs. William Bielfeldt and children, Raymond and Irving, Mrs. Henry Bielfeldt and son Elmer, Mr. and Mrs. Gus. Hoff and children, Donald, Evelyn and Earl, Ruth Matson, Mrs. M.J. Tillotson of Crete, Miss Mabel Morrisey of Ellwood, and Anna Bielfeldt. 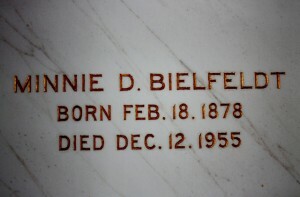 Mrs. Minnie Bielfeldt, 77, a former resident of Beecher, passed away Monday noon at the Mercy Hospital , Gary, Indiana. 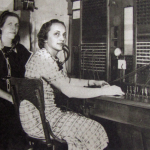 She will be remembered by many as having operated the telephone office here when phone service was first started in the village. 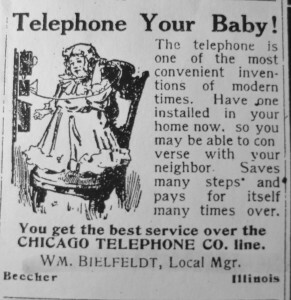 Mrs. Bielfeldt was born February 18, 1878 in Chicago. 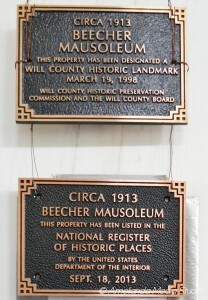 She made her home in Gary for the last fifteen years, after residence here and in Chicago Heights. 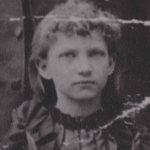 Surviving are two sons, Irving of Chicago Heights and William of Gary; three grandchildren and one great-grandchild; one sister, Mrs. Ella Brouckmann of Freemont, Michigan. She was preceded in death by her husband, William, and one son, Raymond. Funeral services are being held today (Thursday) at 2 p.m., from the Hack Chapel, with burial in the Beecher Mausoleum. Funeral services for Mrs. Minnie Bielfeldt, 77 of Gary, Ind., will be held Thursday at 2 p.m. at the Hack Chapel in Beecher. 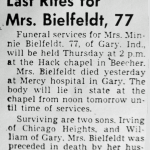 Mrs. Bielfeldt died yesterday at Mercy Hospital in Gary. The body will lie in state at the chapel from noon tomorrow until time of services. Surviving are two sons, Irving of Chicago Heights, and William of Gary. 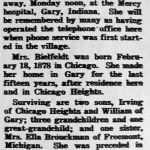 Mrs. Bielfeldt was preceded in death by her husband and one son. Editor’s note: Minnie’s first born son, Raymond J. Bielfeldt, served in the US Navy during World War 1 in France, Washington D.C. and Cuba. Raymond contracted tuberculosis while in the Navy, and he never recovered. You can learn more about Raymond on his memorial page.